Open House 12-2PM Saturday, April 6th. Dramatic large new price reduction. Don't miss this rare opportunity to own a spectacular better than new single level all brick 3 bedroom 2 bath home in the prestigious highly sought after luxury community of The Grande Dunes Cipriana Park. This lake front lot offers one of the best peaceful, serene views of the lake, fountain, park of Palmetto trees, and breathtaking sunsets. Enjoy nature and the many South Carolina lake birds from the privacy of your back patio. This beautiful home was built to the highest standards. It is loaded with luxury upgrades throughout that distinguish this home form the tract builders. 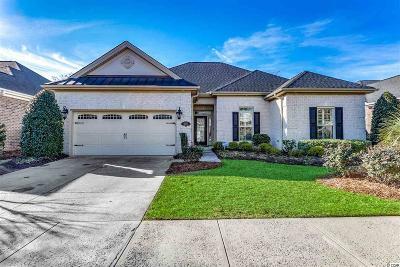 This home was recently professionally painted and features: hand scrapped wood floors, tray and coffered ceilings, ceiling fans, plantation shutters, bay windows, high ceilings, crown molding and plenty of windows to enjoy this serene peaceful setting. The foyer opens up into a large great room and a large Carolina room which overlooks the lake. The chefâs kitchen has stainless steel appliances, granite countertops, tiled backsplash, walk-in pantry, kitchen nook and custom kitchen cabinetry. The master bedroom suite has an oversized spacious walk-in closet, his/her sinks, large linen closet and a tiled shower. The home has been professionally landscaped with multiple palms, ornamental trees, bushes, cement driveway, cement back patio, mulch flower beds, irrigation system, gutters and much more. Additionally, the owners have purchased aluminum hurricane shutters for added safety and security. Owners in The Grande Dunes Cipriana Park have very low HOA dues which include membership to the exclusive 25,000 square foot Ocean Club that features elegant oceanfront dining and oceanfront pools that offer food/beverage service. The Ocean Club also has conference/meeting rooms and even an amenities director that offer plenty of exclusive fun activities. The community also has two 18 hole championship golf courses and a truly private championship golf course designed by hall of fame golfer and renowned golf architect Nick Price. Multiple restaurants, a deep-water marina, tennis facility, fitness center and unending walking and bike paths await you to explore and enjoy. The Grande Dunes Cipriana Park is less than a mile from the beach. Enjoy a short stroll or golf cart ride to the beach, restaurants, entertainment, and all that Myrtle Beach has to offer. Be sure to check out our newly added state of the art 4-D Virtual Tour. All information should be verified and approved by buyer. Square footage is approximate and not guaranteed. Buyer is responsible for verification. Directions: Hwy 17 Bypass To Grande Dunes Blvd. Head East To Cipriana Park. First Left And Then First Right, Home On Right.